Kourtney Kardashian is an American TV personality, model, socialite, and entrepreneur. Born on april 18, 1979, Kourtney is the eldest of the Kardashian’s sisters but standing at 5 foot, she is the shortest of her sisters. Besides TV reality shows, she runs several businesses inline with fashion and retail along with her family. She came to limelight with her participation as the contestant in E!’s Filthy Rich: Cattle Drive in 2005. From there, there’s no turning back, her fame and popularity reached new heights with the family reality show, Keeping Up with the Kardashians. She was born on April 18, 1979 in Los Angeles, California, USA. Kourtney is currently 39 years old. Kourtney went to Roman Catholic all-girls school Marymount High School in Los Angeles. She, then, attended Southern Methodist University for 2 years and earned a bachelor’s degree from University of Arizona, majored in Theatre Arts and minored in Spanish. She wears a shoe size 5 (US) or 35.5 (EU). Kourtney wears a dress size 6 (US) or 36 (EU). Kourtney owns a luxury mansion in the gated community in the Calabasas neighborhood of Los Angeles, California, valued at $7.45 million. The house is equipped with 6 bedrooms, 7 bathrooms, a large living room, a dining room, a four car garage, a spa, a theare and a pool. The 11,746 square feet mansion sits on lavish 1.86 acre of land. She owns a Mercedes-Benz SLS 500 AMG, and a Mercedes-Benz S 500. Over the years, Kourtney has amassed a net worth of $40 million dollars. Her source of income comes from television appearances, endorsements, business ventures and investments. 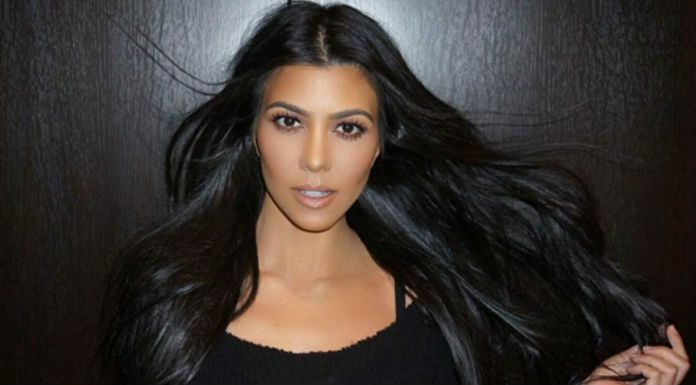 She made a staggering $10 million dollars from the reality series, Keeping Up with the Kardashians and the subsquent spinoff series earned her another $3 million that forms the major part of her fortune. Kourtney involves in family business with her sisters, has a boutique store in multiple venues, called D-A-S-H as well as clothing line – Bebe and Sears. She runs another clothing line exclusive for children, called Smooch which has its stires in Los Angeles and New York City. Kourtney has co-written a book along with her sisters, Kim and Khloe, titled “Kardashian Konfidential, which was released in November 2010. She launched a sunless tanner with her sisters, called Kardashian Glamour Tan the same year. The sisters have also launched a jewellery line the same year for the brand Virgins, Angels and Saints. Kourtney represents a weight loss diet supplement ‘Quick Trim’ with her sisters and a skincare line called Perfectskin. Kourtney Kardashian received widespread media attention with her on-and-off relationship with Scott Disick. The couple together have three kids. Today, Kourtney established herself as a celebrity with immense popularity apart from that, she has several business ventures. Kourtney Kardashian net worth is estimated to $40 Million as of June 2017.